The last thing anyone wants to think about when their loved on is end of life care. Finding a top rated, reputable hospice care center in Glendale can be challenging. Your loved one deserves the best care possible, so your standards should be exceptionally high in that regard. You can’t trust just anyone to give your loved on the care they deserve. At Americare Hospice & Palliative Care, we offer professional end of life care for patients in Glendale and throughout the Phoenix Valley. Our skilled and compassionate hospice care workers are among the highest rated in Glendale, giving you the support you need. At Americare Hospice & Palliative Care, we work hard to ensure that each one of our patients is comfortable and adequately cared for in their time of need. We are a top rated hospice care facility with staff who are compassionate and friendly who can offer long term and short term support, making us the best hospice center in Glendale. We help our patients is a dignified and ethical manner, ensuring that their needs are met and exceeded. A comfortable, home-like environment that contrasts that of hospitals and nursing homes. Affordable financing options and financial relief for treatment. In-home hospice units, giving you the ability to offer your loved one the opportunity to experience the end of their life from the comfort and familiarity of their own home. A supportive staff, talented doctors, caring nurses, and excellent volunteers. The best symptom relief that will give your loved one the opportunity to pass on with little to no pain. A dignified, loving, and more ethical way to allow your loved ones to pass on. Opportunities for you to be with your loved one as they move on. Spiritual counseling and bereavement services. Americare Hospice & Palliative Care is mandated by the Ethical and Religious Directives for Catholic Health Care Services, but we do not by any means exclude patients of other faiths. As a Glendale Catholic hospice center, we have spiritual counselors who offer spiritual guidance and support during their time of need. We have a strong reputation for high quality care that makes patients and family members of patients alike feel comfortable and at ease when they visit Americare Hospice & Palliative Care. We have a strong dedication to providing the best Glendale Catholic hospice care in the Valley, offering both spiritual and bereavement support for all of our patients and their families. Battling a life ending illness can be stressful on not only your loved one, but you as well. Traveling to and from the hospice unit can be time consuming, making it difficult for you to visit while they are battling through their illness. 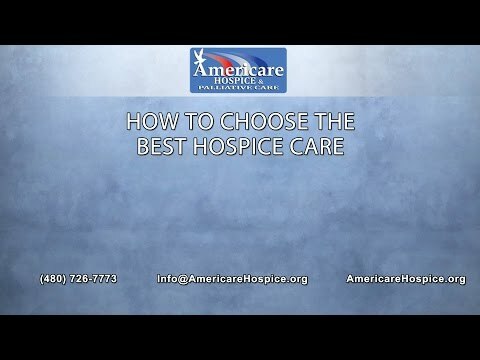 Americare Hospice & Palliative Care offers the best in-home hospice care in Glendale, providing your loved on the comfort they deserve as they struggle with their terminal illness. In addition to in-home hospice care to make your loved one’s end of life illness as easy and painless as possible, Americare Hospice & Palliative Care offers the best bereavement support to help you cope with the trauma of your loved one’s death. Grief, mourning, and sadness after the loss of your loved ones can affect you for a long time to come, and it is important to seek help. Using our hospice and palliative care services gives us the additional experience to help you handle their passing. Americare Hospice & Palliative Care is the best hospice care center near you that has skilled nurses servicing the entirety of Glendale and throughout the Valley. When you are in need of top rated hospice care in Glendale, consult with our skilled and compassionate hospice care professionals to help your loved one through their illness.